Nürburgring Estate - Wagon induced whiplash! The first thing that comes to mind of most people when they hear the words �Volvo Wagon� likely is something along the lines of �Grocery Getter�, but Florian Laurisch's 1996 Volvo 850R, as the BTCC Competition Volvo once did, is doing its best to change this stereotypical reaction. The 850 was a breakthrough model for Volvo. Following in the footsteps of 480ES, only available overseas, the 850 was Volvo's way of revolutionizing and updating their familiar but aged line up around the world. In the eyes of this beholder, the new design, especially the taillights, were not only revolutionary and avant garde, but one day would be classic. Florian hasn't always driven Volvos. He had an E36 BMW 320i, which he found was too slow. Looking for a new car with some more power, he first tested an Alfa Romeo 155Q4. 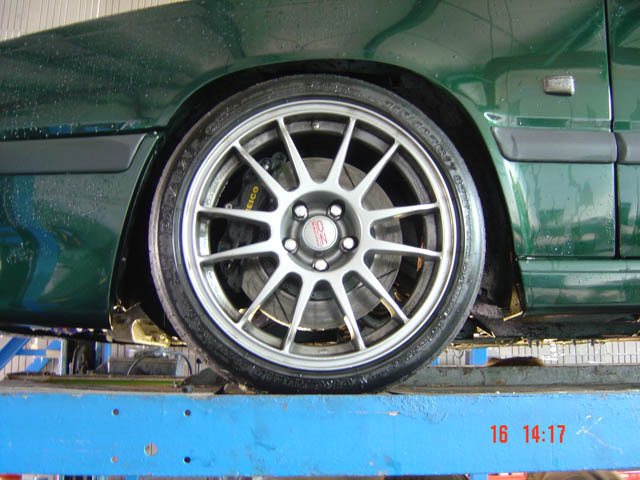 Although the car had its positive aspects, the quality all around was low and the condition was miserable for a car of only 3 years of age. Stepping back into the BMW dealership, something caught his eye. It was a 1995 Volvo 850T-5. The modest design of the car, merely a year old at the time, attracted him and the 019 Black paint and 5 speed manual transmission brought him closer. All it took was one step on the throttle in third gear to fall in love. This drive took him back to memories of Walter Roehrl and the Group B rally cars of his childhood. The roar of the I5 reminded him of the sound of the turbocharged I5 Audi Quattro S1, which still today causes him to feel chills when he hears a certain 1991 Audi 200 20v Quattro pushing 400hp running at the Nürburgring. He knew he had to have this car. 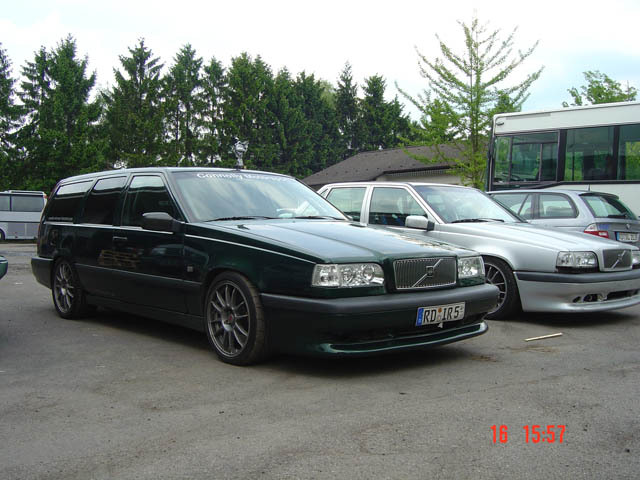 The Volvo of choice for him today is an Olive Green 1996 850R Wagon. 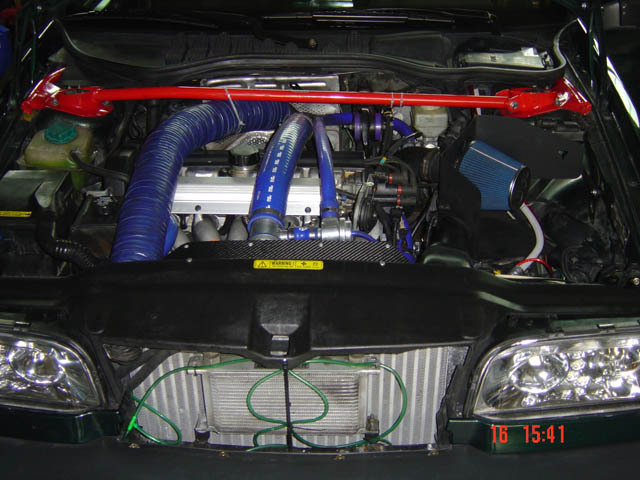 This car, fully Eurospec, came equipped with the Volvo M59 manual 5 speed transmission, featuring a viscous limited slip differential, sport tuned suspension, a larger Mitsubishi TD04-16T turbocharger, and 250bhp from the from the factory. Today, the M59 transmission and differential remain as does the B5234T4 engine, but many other parts have made way for higher performance pieces. The upsized TD04-16T turbo has been once again replaced with a TD04-19T from a V70R, fed by a BSR Optiflow intake and feeding 20psi into a 40mm Kylarjonsson hi-flow intercooler, along with larger 350cc injectors all controlled by a custom mapped Rica ECU. Boost control has been taken over by electronical BLITZ Sbc Spec S unit. All IC tubing has been redone in Aluminum piping and Samco silicone hoses. A Forge DV006 recirculation valve has been installed into the upper IC hose and blanking plate now seals the compressor housing where the original compressor bypass valve used to sit. When the original spark plug wires started to fail under full boost they were all replaced by Magnecore items. Gases escape the turbo thanks to a turbo back 3� Ferrita Group A stainless steel racing exhaust and 3� catalytic converter. Excess drag has been shed thanks to Unorthodox Racing underdrive crank pulley, which reduces the power steering and alternator drive ratios by 15%. These underdrive pulleys also decreased weight and inertia at the crank greatly due to the new 0.4kg weight of the Unorthodox Racing pulleys as compared to the almost 2.5kg of the stock pulleys. To keep the excessively hot engine a bit cooler an extra front mounted 19row 330m wide oil cooler from MOCAL has found its way to the engine bay. An insulated hi temp resistant hose ducts air from the front grill on top of the charger housing. The sport tuned suspension from Volvo has been replaced with KW Variant III coilovers completely adjustable in height, compression and rebound. Sitting on special front coil springs. PU has provided an upper engine mount and lower control arm bushings. Sway is controlled by swaybars from iPD. An OMP strut tower brace helps to keep the coilovers where they belong, and a custom welded roll cage reinforcement attaches the strut towers to the roll cage at the A pillar. Stopping power is provided by HEICO AP Racing 325mm brake kit inside of the OZ Superleggera wheels wrapped with massive 245/35R17 tires. 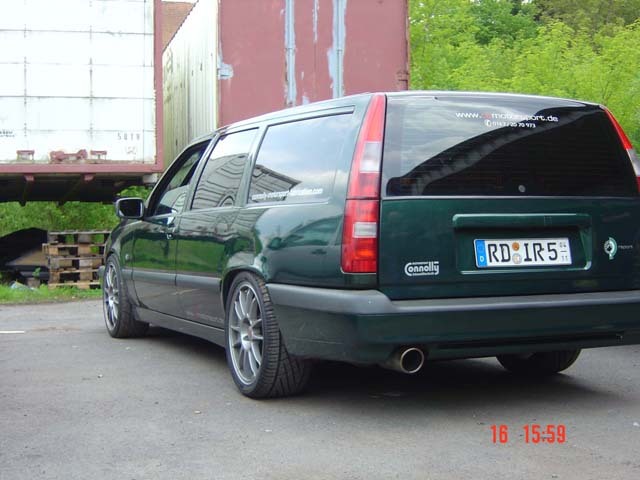 From the outside, Florian's 850R looks stock except for the unusually low ride height, clear Jewel style headlights, side markers from HOVA, and V70 series one taillights and turn signals. On the other hand, the interior is nothing like it was when it came from the factory. 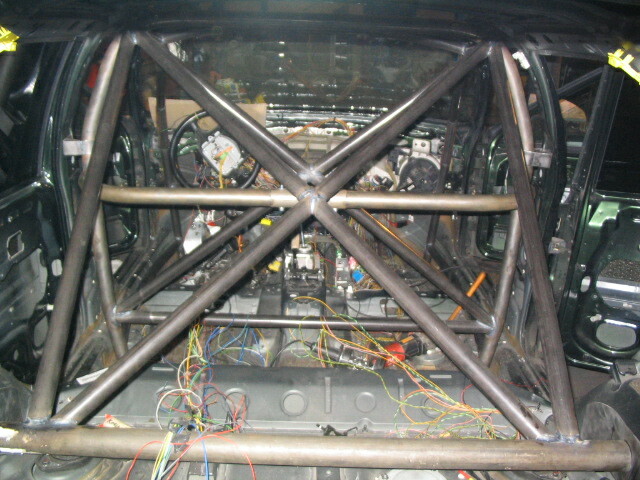 The interior has been stripped to the metal and tied together by a fully welded chromoly steel roll cage exceeding DMSB (German Motorsports Association) and FIA regulations. The cage was made by the expert Martin Connolly, who has long experience in touring car racing and has also built the tubular frames for the German V8-Star series. 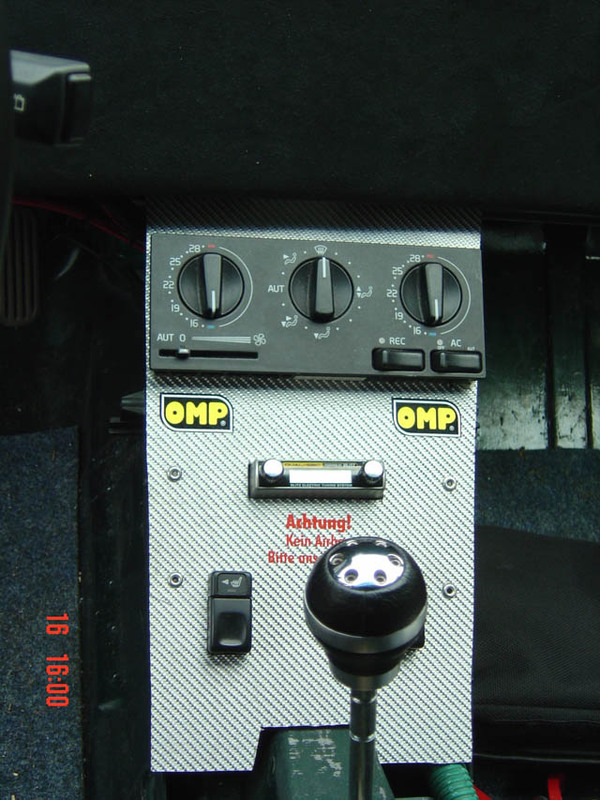 Door panels, dashboard trimmed in alcantara, and center console, that now carries the remaining switches, have been redone in carbon fiber. The power windows have been removed in favor of aluminum hand levers. 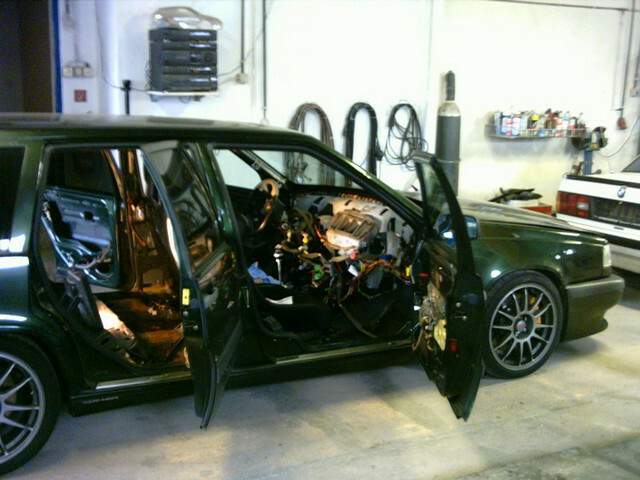 Almost no electrical and luxury �toys� remain: The air conditioning is gone, the central locking system is missing, headlight and tailgate washers and wipers have been removed (The tailgate washer is now used as an intercooler sprayer), fog lights are removed and now feature custom made air cooling hoses for the brake calipers. 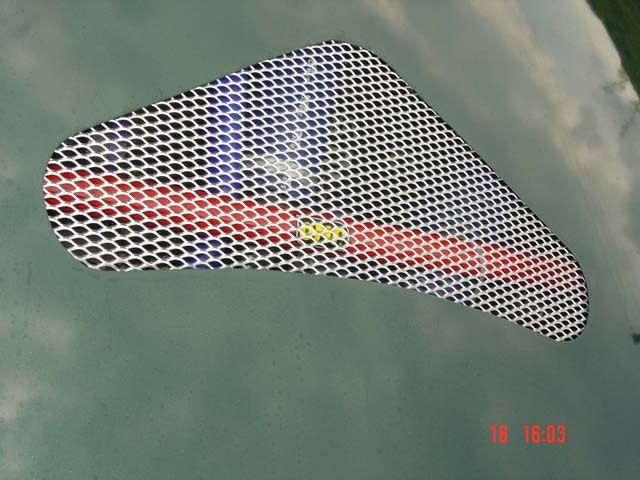 The sunroof has been replaced by a custom carbon fiber panel. The stereo has left in favor of the sound of the roar of the I5, the battery has been exchanged with a lighter Honda item that has been moved to the spare wheel well and covered with carbon fiber.. SPARCO Fighter racing seats with SABELT 3� 4 point harnesses hold him into place on the track, the steering wheel has been replaced with an OEM Volvo racing steering wheel without an airbag, VDO Boost and oil temperature gauges have been fitted, the entire car has been rewired to a new fiberglass fuse box and a carbon fiber switch panel that sits in front of the gearshift. All of these modifications have removed about 600lbs and have brought the car to about 2870lbs. For the future of this car, expect to see a custom welded exhaust manifold holding the 19t up, and some 395cc �Green� injectors from a later Volvo. Florian is chasing after temperature problems causing the engine oil temperatures to get too high during races, which will most likely be battled by a carbon fiber underbody plate to replace the OEM skid plate in the hopes for less underbody turbulence and increased air flow via ducting and a rearward facing low profile �hood scoop� style vent. All of these modifications have made this car into a racing machine. Florian flaunts its racing capabilities regularly in Clubsport events and track days on tracks such as Motopark Oschersleben, Eurospeedway Lausitz, and the legendary Nürburgring Nordschleife, In the end of April, he will be attending a 4 day course at the Nürburgring his national Class A racing license. Obtaining this race license will be Florian's first step into competitively racing the car. 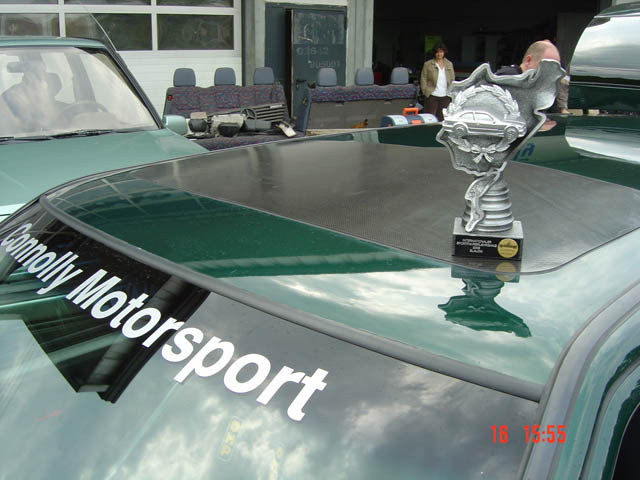 Because of the extensive modifications to the car and lack of comparable cars, finding a class to race it in competitively is another obstacle to overcome. There is consideration pursuing the German �Youngtimer� Trophy, although, the car will not be old enough to compete for another 3 years. Until then, he is eyeing the Castrol-Haugg Cup held at the Nürburgring Nordschleife because it is a moderately competitive series and his 850 most likely would meet the regulations with little time and effort. The Volvo B5234T4 motor spun by a Mitsubishi TD04-19T turbo, BLITZ Sbc Spec S unit electronic boost controller, Forge DV006 recirculation valve complete with a CBV Block-off plate is bolted to a 3” Ferrita Group A stainless steel racing exhaust with 3" catalytic converter. In addition, an air duct from the grill to the turbo was added to cool the housing and keep underhood temps down. BSR Optiflow intake is fed through all aluminum piping connected to a 40mm Kylarjonsson hi-flow intercooler to help keep the intake charge temps at a minimum. 350cc injectors powered by a Rica ECU along with Unorthodox Racing underdrive pulleys and Magnecore 8.5mm Racing spark plug wires provide the support for the power output. A Mocal 19row 330mm oil cooler was added to keep the oil supply nice and cool. The stock Volvo M59 5-Speed and Volvo OEM 850R Clutch puts the power to the wheels along with the stock LSD. KW Variant III coilovers provide the ride characteristics, the PU Upper torque rod and lower control arm bushings make sure its staying put and the iPD swaybars with OMP Strut brace help the fully welded chromoly roll cage keep the car from twisting. Heico Sportiv AP Racing 325mm brakes stuffed inside OZ Superleggera Wheels complete with brake cooling vents piped in from the fog lamps. HOVA jewel headlights and turn signals and V70 Series-I tail lights and side markers. 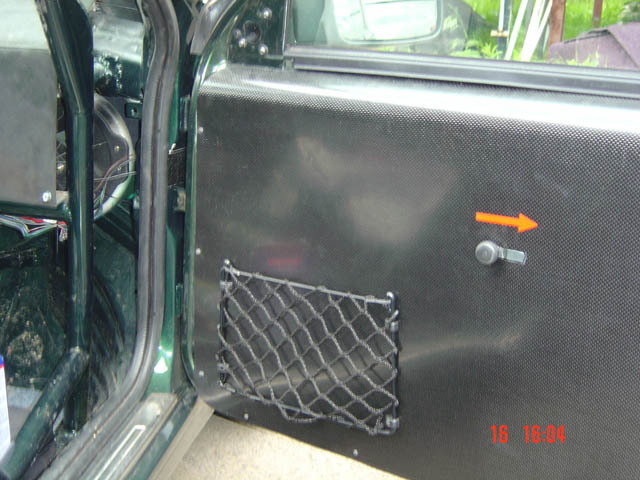 The rear doors have been welded shut. 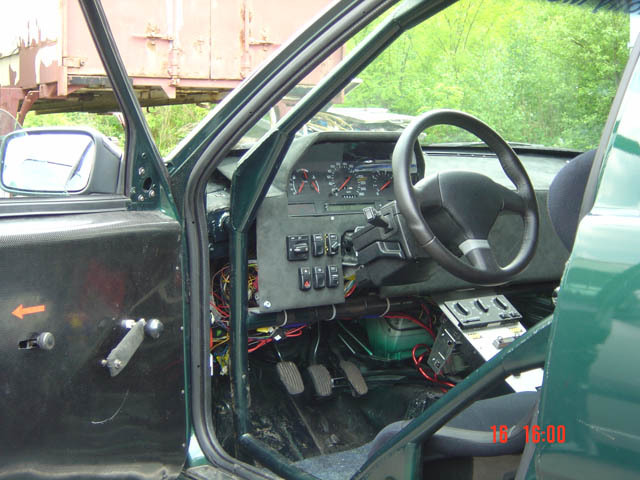 All the interior and dashboard has been removed and everything fully re-wired. The interior was replaced with Carbon Fiber door panels, dashboard (wrapped in Alacantra suede), sunroof panel, and center switch panel. SABelt 3" 4point harnesses run through 2 Sparco Fighter racing seats, and the OEM Volvo Racing steering wheel without airbag and VDO Boost/oil temp gauges finish it off.